a removable wire and acrylic palatal appliance used to retain or stabilize the teeth in their new position following orthodontic tooth movement; with modifications it can be used to move teeth as an active orthodontic appliance. an orthodontic appliance consisting of a removable labial wire and an acrylic biteplate resting against the palate, used to stabilize teeth after their movement or as a basis for tooth movement by providing anchorage for other attachments. Also called Hawley appliance. Removable wire and acrylic palatal appliance used to retain or stabilize the teeth in their new position following orthodontic tooth movement. Also called Hawley appliance. C.A., 20th century U.S. orthodontist. 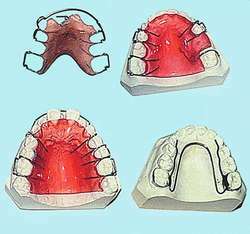 Removable wire and acrylic palatal appliance used to hold or stabilize teeth in their new position following orthodontic tooth movement; with modifications can be used to move teeth as an active orthodontic appliance.